Welcome to #thejuicylife series – A 101 Guide to Juicing & Smoothies! I’m so excited to finally share this project everyone! This series is for you if you’re ready to get your healthy glow, love your beautiful body and live a delicious life. Episodes will air Monday – Friday for three (3!!) weeks. Please ask questions, leave comments and share with your friends. Subscribe today so you don’t miss an episode! 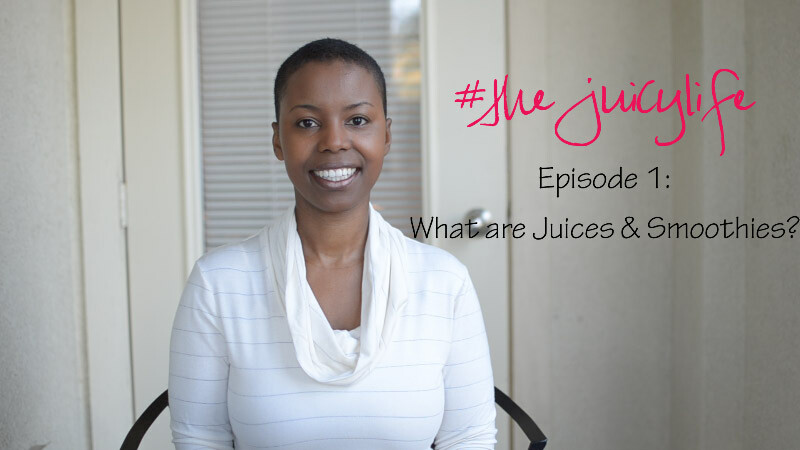 In episode 1 I’m talking basics: What are juices and smoothies? Are they different and what are their benefits? This is one of the top questions I get asked so hopefully this video helps to clear up any confusion. I’ll talk about this subject a little bit more when I review my juicers and blender. In the video I mention that you can mix your smoothies with water, fresh juice, coconut water, almond and soy milk. You can, of course, also use coconut milk! ← Raw & Simple Giveaway Winner & #thejuicylife Project Update! Love it! We are doing “drink your greens” this month so I’ll be sharing this on my page. Thank you so much!